Home > Blog > Dynamic DNS. DynDNS providers. DNS-o-Matic as a service. Тhe Domain Name System (DNS) is spread across the Internet naming system for computers, services or other resources. Its major role is to translate human-oriented names to IP addresses. They are mandatory for IP based communication. DNS is hierarchical and decentralized. It takes relatively long time for a record’s update. Many ISPs use DHCP to provide IP addresses to their customers. Some of them change these IP addresses within 24 hours or less due to address shortages, as well as for security reasons. This time is not enough for record’s change in DNS. ‘Dynamic DNS’ stands for Dynamic Domain Name System, also known as DDNS or DynDNS. Dyn DNS allows users who receive a dynamic IP address from their ISP to provide web content, file, or another service to users outside of their local network. Dynamic DNS helps to achieve this despite frequent updates of user’s IP address. The user can do this by using a Dynamic DNS service provided by DynDNS operator by creating a record in the operator’s system that will be automatically updated upon each change of its IP address. In order for the dynamic DNS service to be used, a provider of this service must first be chosen. The vendor will provide a server in which to maintain the correspondence of the permanently changing IP address and fixed domain name. Whenever the IP address of the device changes, the device reports it to Dynamic DNS server. The DynDNS ensures that changes to the IP address are detected and DNS records are properly updated. If the customer wants to connect to his device, he has to send a DNS request to the registered domain in DynDNS server. For example – tcw220.dns.com. 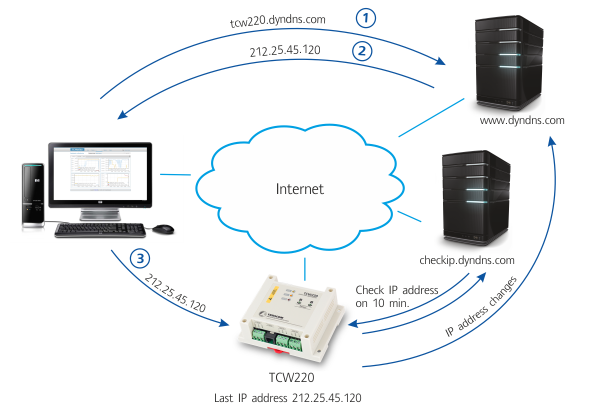 The DDNS server then automatically supplies the current IP address of the internet service provider stored under the name. At present, a dynamic DNS service offers many operators, some of which are paid. The table lists some of the more well-known operators and the corresponding payment for the use of domains and subdomains. No-IP is one of the best and most used DDNS service providers. Their unpaid version includes port forwarding and URL redirection, making it ideal for home networks. Creating an account is easy, the only downside is that the account needs to be verified every 30 days. ChangeIP is a service close to No-IP, except that it does not support port and URL redirection. On the other hand, it has a wide choice of subdomain names. The cost for your own domain is as low as 6 USD per year. DynDNS recently offers only a paid service. This is one of the most developed platforms used by many leading IT companies. DNS-O-Matic is a platform that allows users to update their dynamic IP address information to multiple operators simultaneously. This service allows you to add several DynDNS providers (including those listed in the table above) by creating an account in the system. DNS-o-Matic is, in fact, a translator between the different protocols of the various Dynamic DNS providers. If the device (router, server, Ethernet controller) does not support DDNS functionality, it is necessary to install software that will monitor and report the IP address’ change to the DNS-o-Matic platform. The platform itself will update information to the user-selected DynDNS providers. DNS-O-Matic allows you to pick and choose what Dynamic DNS services you want to notify, all from one easy to use interface. All this for free. 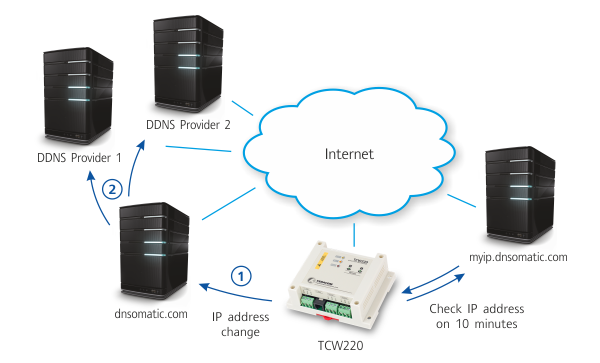 The following Teracom devices support Dynamic DNS: TCW210-TH, TCW220, and TCW241.